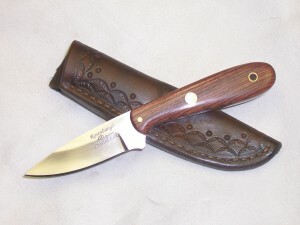 3 1/8 inch small pack knife, 7 inches OAL, 1/8 inch thick, 7/8 inches wide made from ATS34 stainless steel. The blade has an 800 grit matte finish. The handle scales are Kingwood with brass rivets, pins, and thong tube. The sheath is a russet dyed pouch with border stamping.